Make your next celebration all the more unforgettable with Gormo’s Castles Our family owned business that offers jumping castle hire services in the Hawkesbury for both adults and children. Gladiator combat arenas, bungee runs, mechanical bulls and other fantastic party gear are available for hire at prices that are very competitive. The themed jumping castles offered by our Hawkesbury based party hire business are guaranteed to bring hours of fun to any birthday party or function. For your convenience, Castle and Bull Hire will deliver and pickup all the items we hire out and our business is fully insured. 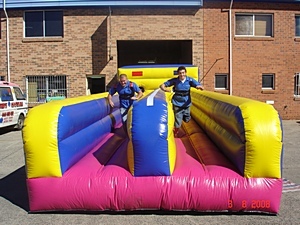 To find out more about our Hawkesbury based jumping castles and party products, or to request a quote, don’t hesitate to call Gormo’s Castles today. In addition to the Hawkesbury our services are available in the Nepean district, the Hills district, Blacktown and surrounding areas. All of the castles are fully insured, although it is still your RESPONSIBILITY to supervise the children on the castles at all times. Reasonably Flat area is needed to erect castle, always BEST on soft grassed areas so PEGS/STAKES securely ANCHORED! OTHER surfaces considered PRIOR to BOOKING.